Fake news or ‘alternative facts’ have become a key ingredient of Western political discourse. They are skillfully used by populist candidates to leverage fears and frustrations of the voters. The fake news efforts are often successful. For example, as Ipsos’ 2016 Perils of Perception survey shows, in all Western countries voters greatly overestimate the Muslim population in their countries. In France (where the gap between perception and reality is largest), the perceived share of Muslim population is 31% while the actual share is only 7.5%. Can this sway elections? Recent work by Allcott and Gentzkow (2017) suggests that, even though false rumors about Hilary Clinton were more likely to be shared on social media, it is not clear whether they were pivotal in the 2016 US presidential election. In a recent paper (Barrera et. al. 2017), we show that misleading statements used by a populist politician can have substantial effects on voting intentions. Moreover, while fact checking of the populist’s misleading ‘alternative facts’ improves voters’ factual knowledge, it does nothing to undo the effect of these statements on policy views and voting intentions of voters. We study these questions in the context of the 2017 French presidential election. The 99% figure was refuted by statistics from the United Nations High Commissioner for Refugees, which reported that men accounted only for 58% of refugees crossing the Mediterranean in 2015. The day after Le Pen said this, she was declared wrong by several major media outlets. However, in addition to reporting an ‘alternative fact’, Le Pen presented a logical – albeit unproven – argument to reach a desired conclusion that migrants come for economic reasons (rather than for security reasons), thus justifying her tough line on the issue. Potentially, a political message that combines alternative facts, logical links, and conclusions may affect voter’s factual knowledge, subjective impressions relevant for the policy conclusions and, ultimately, voting intentions. To understand the impact of fact checking of the narratives based on fake numbers, we carried out an online experiment in the midst of the French 2017 presidential election campaign. The 2,480 experiment participants were randomly allocated to four equally sized groups; each group read different statements about refugees. Group 1 (“Alt Facts”) read some of Marine Le Pen’s statements, including the one mentioned above. All the quotes had a similar structure: misleading statements were used as part of a logical link to reach a desired conclusion. Group 2 (“Fact Check”) read the same Le Pen quotes along with the facts from the official sources on the very same issues; these facts were strikingly different from Le Pen’s misleading numbers. Group 3 (“Facts”) read only the facts from the official sources without any ‘alternative facts’. Group 4 (“Control”) didn’t read any text. All participants subsequently answered a survey on political preferences and factual knowledge. Prior to the treatment, the participants had been asked about their socioeconomic characteristics. As shown in Figure 1, we find that Marine Le Pen’s statements are highly persuasive, regardless of whether they were subsequently corrected. 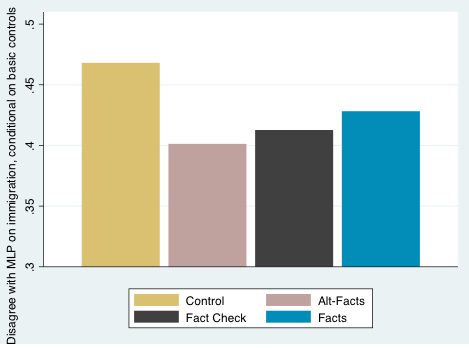 Both participants in the Alt Facts and Fact Check groups were 7% more likely to report intentions to vote for MLP. Our result that fact checking of a populist’s statements does not change the voters support of the populist candidate is consistent with findings of concurrent research conducted in the context of the 2016 US presidential election (Swire et al. 2017, Nyhan et al. 2017). Does this mean that voters do not believe the corrections or do not trust the source? The answer is no. 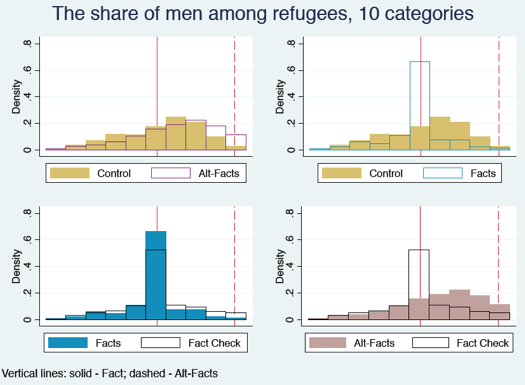 The majority of respondents in the Fact and the Fact Check groups answered the questions about facts at the end of the survey correctly, as illustrated in Figure 2 for the question on proportion of men among refugees – a very large difference compared to the control group. 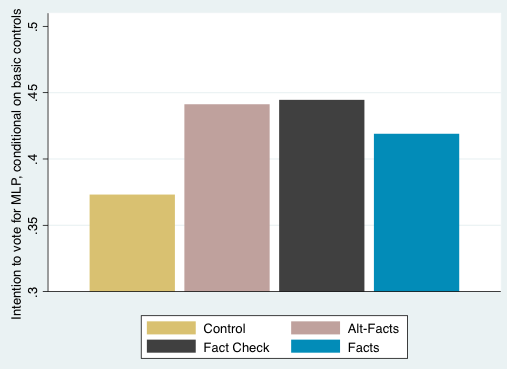 The Alt Facts treatment moved respondents away from the truth, but only slightly. Overall, we find strong evidence that respondents learn the facts and trust official sources more than Le Pen. The views on immigration policy do not reflect the improved factual knowledge, however, and are entirely consistent with the effect on voting intentions. Participants in the Alt Facts and Fact Check groups are 13 and 8 percentage points more likely to believe that migrants come for economic rather than security reasons compared to the control group, and are 7 percentage points less likely to disagree with Le Pen on immigration issues. Overall, our results imply that once voters have learned the conclusions, correcting the fake facts can no longer shift their policy views. Does this mean that fact checking is useless? Our results suggest that confronting alternative facts with correct numbers is not enough. To be effective, fact checking needs to be more than a journalists’ or pundits’ enterprise. The correct facts need to be embedded in a narrative with persuasive argumentation and conclusions – and delivered by a charismatic politician. The result of the 2017 French presidential election is consistent with this conjecture. Barrera O D, S Guriev, E Henry and E Zhuravskaya (2017) “Facts, Alternative Facts, and Fact Checking in Times of Post-Truth Politics”, CEPR Discussion Paper 12220. Nyhan, B, E Porter, J Reifler and T Wood (2017), “Taking corrections literally but not seriously? The effects of information on factual beliefs and candidate favorability”, mimeo, Darthmouth College. Swire, B, A Berinsky, S Lewandowsky and U Ecker (2017), “Processing political misinformation: comprehending the trump phenomenon”, Royal Society Open Science 4(3):160-802.